CHICAGO, IL -- Have you ever played a basketball game with fake nails? What about lead a team in scoring, rebounding, assists, and steals with fake nails? If you have answered 'NO' to the two previous questions, then the chances of you being ranked as a top 20 prospect in your class (with fake nails) are slim. Don't feel bad... it's not easy. 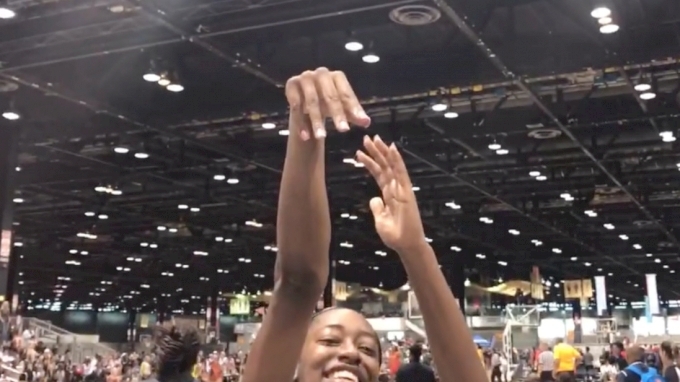 Leave it to DFW Elite's Zarielle Green to keep her look as ballin' off the court as it is on when she flashed her fresh Nike Nationals tips for the camera at Nike Nationals on Monday afternoon. Any lady hooper knows the risks of playing with tips, breakage and shot alteration, outweigh the rewards, but none of that seems to phase Green. Green has played for DFW Elite's NIke Girls EYBL team since the eighth grade. Fast forward four years and she is undeniably the team's leader on and off the court. Green is averaging 14.9 points per game, 6.3 rebounds per game, 3.9 assists per game and 1.7 steals per game as DFW Elite went 1-1 on opening day at Nike Nationals. Surprisingly, Green is one of the remaining 2018 prospects that has yet to commit to play at the next level. The No. 13th ranked prospect in her class (ESPN), Green has narrowed her options down to UCLA, Kansas, and Texas A&M. See what Green and the rest of the Nike Girls EYBL has to offer as Nike Nationals continues on Tuesday, July 11th & 12th.